Our research in the High Atlas Mountains started with a National Geographic Grant to investigate the timing and nature of river incision as a result of the Plio-Quaternary uplift that has shaped the present day geomorphology. This recent uplift has resulted in dramatic incision of the Dades River amongst others. Stokes et al., (2008) investigated in detail the evolution and progressive incision of the Dades River, and the control of the underlying geology on the routing of the river through the landscape. 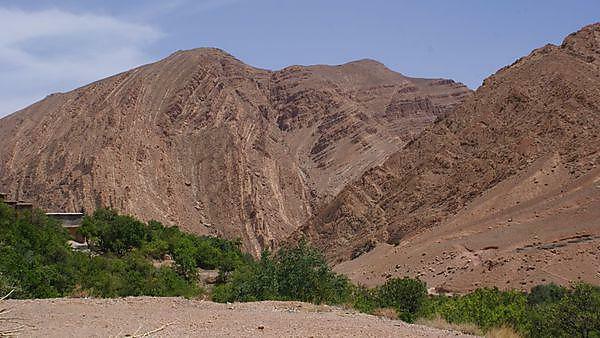 The wider evolution and river incision story was published in Boulton et al., (2014) where 32 river long profiles (i.e., height vs downstream distance) across the High Atlas Mountains where shown to contain knickzones (areas of increased steepness) resulting from tectonically driven uplift and resulting incision of the river. In order to calculate how fast river incision has been occurring in the Dades River system, samples from river terraces were taken for optically stimulated luminescence (OSL) analysis. Stokes et al. (2017) report the results of these analyses showing that the rate of incision is in fact very low (< 0.2 mm/yr) but has been sustained over a long period of time (since early Pleistocene). This suggests Quaternary tectonic mountain building and erosion is very slow and further suggests that the High Atlas mountain building was a pre-Quaternary phenomenon. In addition, the formation of the terraces is linked to 100 ka climate cycles, suggesting that even on the edge of the Sahara Desert glacial-interglacial transitions have significant effect on landscape development. In the Autumn of 2017, a new PhD student, Jesse Zondervan, will continue our river terrace research investigating further the regional tectonic and climatic control topics of river terrace formation in a series of different river systems draining the High Atlas. As well as investigating the regional effects on landscape evolution, the area allows fundamental research into poorly understood geomorphic processes. The Dades River was used by Stokes and Mather (2015) and Mather and Stokes (2017) to investigate the controlling factors (climate, topography, sediment supply, bedrock geology) on the formation of tributary junction fans. The alluvial fans build into the deep High Atlas mountain valleys but are often eroded by large floods, whilst the bedrock geology strength / erodibility is important in supplying and suppressing sediment to the tributary junction fans. As well as investigating the Plio-Quaternary evolution of the High Atlas Mountains, Dr Sarah Boulton has also been investigating the earlier Miocene development of the mountain chain. Key questions remain as to when the High Atlas Mountains gained significant height and whether they have formed through pulsed or continuous uplift. Understanding the long term development is critical for placing constraints on when desertification in the Western Sahara began and how this region fits into plate tectonic models of the Western Mediterranean. Miocene lake sediments from the adjacent Ouarzazate Basin have been sampled for chemical isotopes sensitive to altitude to find out how high the mountains were ~ 8 million years ago. Preliminary results have been presented (Boulton et al., 2016) and further publications are being written. In spring 2017, Dr Sarah Boulton and Dr Martin Stokes were awarded 10 tiles of high resolution digital elevation model (DEM) data of the study region. These data offer unprecedented detail of the geomorphology of the High Atlas, and will allow further insights into the landscape of the High Atlas Mountains. Focusing initially on the Dades River catchment, this high resolution (12 m) TanDEM-X dataset has been compared to three lower resolution (30 m) DEMs to investigate the effect that DEM choice has on the results of commonly implemented methods of investigating river geomorphology (Boulton and Stokes, 2018). Both the TanDEM-X and the Alos World 3D DEMs are shown to have excellent resolution in comparison to older DEMs, but that the Alos World DEM produces more realistic river networks. The TanDEM-X data continues to be utilised by PhD student Jesse Zondervan. The changes in Quaternary climate, tectonic activity and the wide variation in rock types within the High Atlas has resulted in the development of large scale and widespread landsliding. A recently awarded Royal Geographical Society Thesiger-Oman award will involve looking at landslide distribution and hazards to people living in the High Atlas. Boulton S.J., Stokes, M., (2018). Which DEM is best for analyzing fluvial landscape development in mountainous terrains? Geomorphology, 310, 168-187. Boulton, S. J., Stokes, M., & Mather, A. E. (2014). Transient fluvial incision as an indicator of active faulting and Plio-Quaternary uplift of the Moroccan High Atlas. Tectonophysics, 633, 16-33. Boulton, S. J., Vandevelde, J., Mather, A. E., & Stokes, M. (2016). When did the Moroccan High Atlas Mountains get high? Constraints on neo-and active tectonics from fluvial geomorphology and palaeoaltimetry. 7th PATA Days conference, Crestone, CO 81131 USA. Mather, A. E. & Stokes, M., (2017). Bedrock structural control on catchment-scale connectivity and alluvial fan processes, High Atlas Mountains, Morocco. In: D.Ventra, L., Clarke & J., Driscoll (Eds). Geology and Geomorphology of Alluvial and Fluvial Fans: From Terrestrial to Planetary Perspectives. Geological Society of London Special Publication. In Press. Stokes, M., & Mather, A. E. (2015). Controls on modern tributary-junction alluvial fan occurrence and morphology: High Atlas Mountains, Morocco. Geomorphology, 248, 344-362. Stokes, M., Mather, A. E., Belfoul, A., & Farik, F. (2008). Active and passive tectonic controls for transverse drainage and river gorge development in a collisional mountain belt (Dades Gorges, High Atlas Mountains, Morocco). Geomorphology, 102(1), 2-20. Stokes, M., Mather, A.E., Belfoul, M., Faik, F., Bouzid, S., Geach, M.R., Cunha, P.P., Boulton, S.J. & Thiel, C. (2017). Controls on dryland mountain landscape development along the NW Saharan desert margin: Insights from Quaternary river terrace sequences (Dadès River, south-central High Atlas, Morocco). Quaternary Science Reviews, 166, 363-379.